The United States has become ever more deeply entrenched in powerful, rival, partisan camps, and its citizens more sharply separated along ideological lines. The authors of this volume, scholars of political science, economics, and law, examine the relation between our present-day polarization and the design of the nation’s Constitution. The provisions of our Constitution are like “parchment barriers”—fragile bulwarks intended to preserve liberty and promote self-government. To be effective, these barriers need to be respected and reinforced by government officials and ordinary citizens, both in law and in custom. This book asks whether today’s partisan polarization is threatening these constitutional provisions and thus our constitutional order. The nation’s founders, clearly concerned about political division, designed the Constitution with numerous means for controlling factions, restraining majority rule, and preventing concentrations of power. 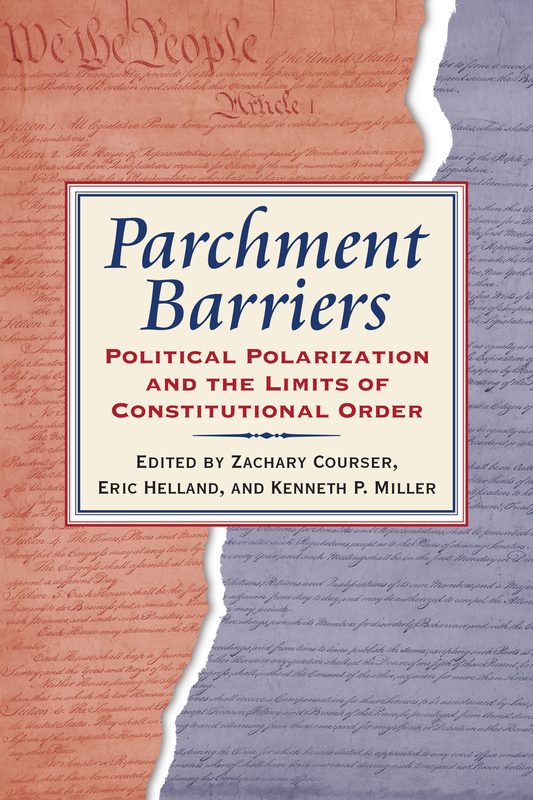 In chapters that span the major institutions of American government, the authors of Parchment Barriers explore how partisans are pushing the limits of these constitutional restraints to achieve their policy goals and how the forces of majority faction are testing the boundaries the Constitution draws around democratic power. What, for instance, are the dangers of power being concentrated in the executive branch, displaced to the judiciary, or assumed by majority party leaders in Congress? How has partisan polarization affected the nature, size, and power of the administrative state? And why do political parties, rather than working to facilitate the constitutional order as envisioned by James Madison, now chafe against its limits on majority rule? Parchment Barriers considers the implications of polarization for policy, governance, and the health of American democracy. Zachary Courser is visiting assistant professor of government at Claremont McKenna College and research director of the Dreier Roundtable. Eric Helland is William F. Podlich Professor of Economics and George R. Roberts Fellow at Claremont McKenna College. Kenneth P. Miller is associate professor of government at Claremont McKenna College and the author of Direct Democracy and the Courts.